DNA is everywhere, including the root system of plants. Up until now few have studied the genetic basis of root structure because it’s difficult to observe how roots grow underground. Asheesh Singh, professor of agronomy, and his doctorate student Kevin Falk are two of the few doing it with help from Baskar Ganapathysubramanian, professor of mechanical engineering, and Gwyn Beattie, professor of plant pathology. AMES, Iowa – An Iowa State University agronomist is charting mechanisms – gene by gene – that could lead to soybean varieties resistant to sudden death syndrome. A paper published recently in the peer-reviewed academic journal Plant Physiology shows a gene found in a model plant called Arabidopsis could confer improved disease resistance in soybeans. Madan Bhattacharyya, a professor of agronomy and lead author of the study, said his current research points toward several Arabidopsis genes that could act in concert to help soybeans fight off sudden death syndrome, a disease that has caused millions of dollars in crop losses for Iowa farmers. Micronutrients are needed in very small quantities by plants, but are essential for their growth and production. A search for understanding how micronutrients can be better managed in the Midwest’s soybean fiel ds has led to new research and a regional publication on the topic. 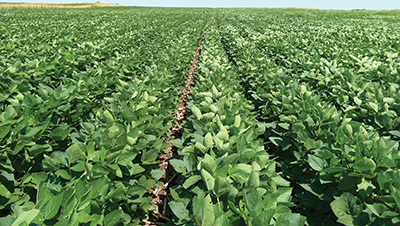 This research and general management guidelines are summarized in the publication “Micronutrients for Soybean Production in the North Central Region” (CROP 3135) and is available through the Iowa State University Extension Store. Antonio Mallarino, professor and extension specialist in agronomy at Iowa State University, led a team of researchers and fertility extension specialists from five universities across the Midwest who worked on the project.